Currently only compatible with 6X1 STEREO Cubestrips. That basically means 12X1 with a resolution of 18432 X 1536. Any other resolution will crash or hang. You will also need a free copy of ImageMagick which you can get from here. Install KRpano by right clicking on the install file and selecting “Run as administrator“. For ImageMagick at the “Select Additional Tasks” screen (the options screen), make sure you ALSO TICK “Install legacy utilities (e.g. convert)”. Install the script as described on http://mornestudio.com/mornescriptspack/ and run it. Build Tour. PLEASE BE PATIENT AND WAIT! A single cubestrip can take a couple seconds to calculate. 7 Cubestrips can take up to a minute or longer! 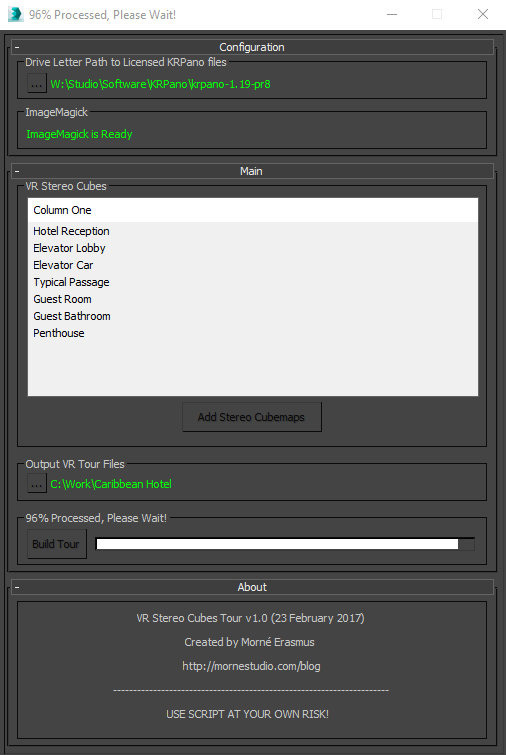 When you are done, you can close the testing server and upload the tour online to your webserver. You don’t need to upload the the testing server files. * The script is free, but you will need a KRPano License. My script essentially runs in 3ds Max and it’s a basic UI for KRPano.